Rumor has it that the details of Mazda’s next-generation Miata will be officially confirmed at the forthcoming New York International Auto Show. And that’s just fine with Tom Voelk. The Ford Focus was bought from an auto writer who prophetically stated “you could easily do car reviews for the TV station you work for.” This was a revelation. My useless command of car knowledge could actually be applied to something. Two weeks later I shot my first review. My automotive writing career had begun. A dozen years later, I’m producing the “Driven” car reviews for the New York Times. Good thing I didn’t buy one of those practical Mustangs or Camaros with back seats. I occasionally review vehicles five times the Miata’s price, and some of them aren’t half as much fun to drive. Mine still looks great but has a few squeaks and rattles. Considering its age, it has earned that right. 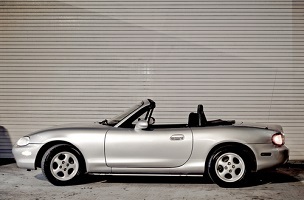 The Miata’s life started in 1976 during a conversation between Mazda executives and a passionate journalist. Bob Hall was with Motor Trend at the time, and is fluent in Japanese. He was asked by the Mazda execs what kind of car the Japanese company should build next. He suggested a roadster that harkened back to the MGs and Alfas that used to roam winding back roads. Hall actually took a job with Mazda to work on such a project. Autoblog’s Noah Joseph has photos of the new-look Miata.